Aiyana Jones’ grieving mother Dominika is led out of court by relatives as mistrial declared June 18, 2013. Aiyana’s grandmother Mertilla Jones speaks to media June 18. “He’s a lying cop,” she said, referring to Weekley. 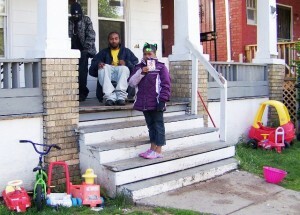 DETROIT – The family of Aiyana Jones, 7, killed by a Detroit police paramilitary unit May 16, 2010 as she slept with her grandmother, endured more torture last week. 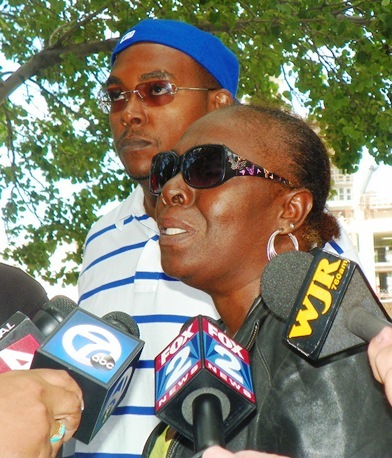 Wayne County Circuit Court Cynthia Gray Hathaway declared a hung jury June 18 in the trial of the shooter, Detroit police officer Joseph Weekley, after only three days of deliberations. Hathaway set a new pre-trial date for Weekley on charges of involuntary manslaughter and reckless discharge of a firearm for July 25. Aiyana’s mother Dominika Jones collapsed in the arms of her uncle, who carried her out of the courthouse. “Ohmigod, this day, I just couldn’t take it no more,” she said on her Facebook page, which showed a news photo (above) from the hearing that day. 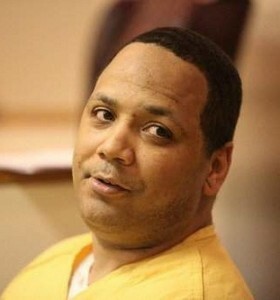 On June 22, Wayne County Circuit Court Judge Richard Skutt set trial dates for Aiyana’s father Charles Jones and her aunt’s former long-time fiancé Chauncey Owens in the killing of Je’Rean Blake, 17 on May 14, 2010, the excuse police used to raid the Jones’ home. Dominika and Charles Jones, who had four children until Aiyana’s killing, are still together. She attends every one of his court hearings with his mother Mertilla and sister LaKrystal. 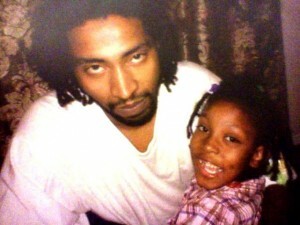 Charles Jones with his only daughter, Aiyana, at an earlier age. Family photo. The trial had been postponed pending a state Supreme Court ruling on whether “jail-house snitch” Jay Schlenkerman could testify against Jones. Skutt earlier barred the testimony as third-hand hearsay, but an Appeals Court summarily overturned his ruling. 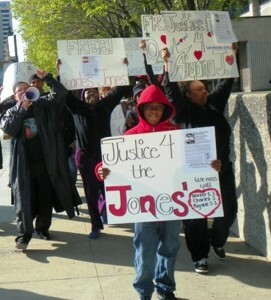 The Supreme Court refused to hear Jones’ appeal June 5, 2013. Skutt set Mon. Oct. 21, 2013 as the trial date, and Sept. 20 as the deadline for pre-trial motions. Both men are being held at Wayne County Jail on charges of first-degree murder, while Weekley remains free on personal bond, at home with his wife and two daughters in Grosse Pointe Park. Wayne County Assistant Prosecutor Robert Moran is prosecuting them as well as Weekley, in what many have called a direct conflict of interest. 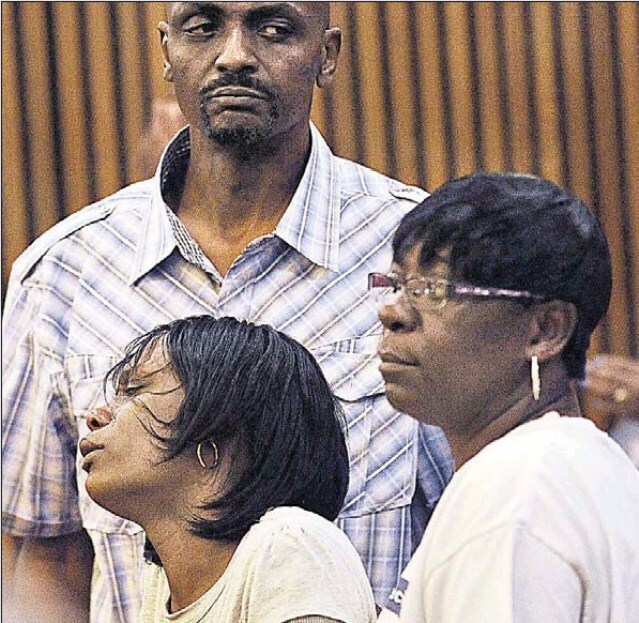 To add further grief, Detroit police arrested and charged an uncle and cousin of Aiyana’s as they were coming home during the trial, on undisclosed charges. Mertilla Jones has said police have continually stalked her family since Aiyana’s death, and that she was advised by an official to get the young men in her family out of town to avoid further arrests. 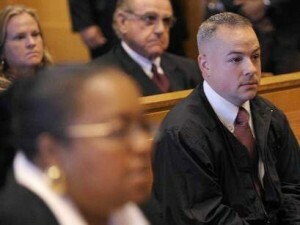 Wayne County Prosecutor Kym Worthy and Joseph Weekley at his arraignment in Oct. 2011. A & E producer Allison Howard and her attorney are in background. On the morning of June 18, loud shouting was heard as the Weekley jury, composed of 11 whites and one Black, continued a third day of deliberations in their room. Later, they sent three notes to Hathaway. The first said they were “stuck,” the second asked if they could find Weekley guilty of only some of the elements of involuntary manslaughter, and the final note, sent only an hour later, said they could not reach a verdict. 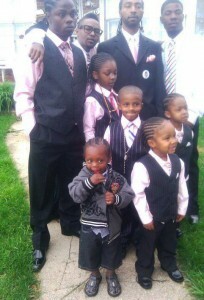 They had been told they could only consider the second charge of reckless discharge of a firearm resulting in death if they found Weekley guilty of the first charge, according to a report from Detroit’s Channel 7 News. Hathaway told them they had to find Weekley guilty of all elements, and asked them to continue deliberating after the first two notes. After the third note, she declared a mistrial and thanked the jury profusely for their service. Aiyana’s grandmother Mertilla Jones rushed out of the courtroom angrily. Jones’s sister JoAnn Robinson was sleeping on another couch in the living room when police stormed the house. She said at a press conference May 18, 2010 that she asked police for a copy of the search warrant, but they did not bring it until around 5 a.m. No arrest warrant for Chauncey Owens, the target of the search, was signed until May 19, 2010. JoAnn Robinson died a little over a year later. Much of Weekley’s testimony directly contradicted that of other officers on the scene, who said they heard a gunshot, the only one fired during the incident, “three seconds” after entry. Weekley maintained that he and Officer Shawn Stallard were going after Vincent Ellis, who was standing in a bedroom doorway, when “a woman” whose braids he could see knocked his gun downwards, causing it to fire and hit Aiyana. Stallard testified earlier that he heard the shot before they pursued Ellis and that he thought that Ellis had fired it. Stallard also said he never saw Weekley struggle with anyone. “I was afraid Weekley was going to shoot Vincent as well as Aiyana,” Mertilla Jones told VOD later regarding her son. 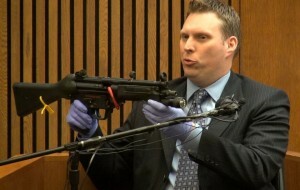 Firearms expert with Weekley’s MP5 testifies during trial. A firearms expert who tested Weekley’s actual MP5 said he threw it on the ground, stomped on it and conducted other tests to determine if it could be discharged without pulling the trigger. He said it could not, and that it took six to eight pounds of pressure to pull the trigger. Nearly every officer testified on direct that they are trained to keep their finger off the trigger of their weapons, even while in a struggle. Hathaway, who kept her married name after her divorce from Wayne County Circuit Court Judge Michael Hathaway, is now married to Wayne County Deputy Sheriff Dewayne Hayes. During the trial, testimony from officers that the Jones family’s home was a “crack house” and that Owens, who has not yet been tried, was a “murderer,” was never challenged as “facts not in evidence” by the prosecution, defense, or the judge. Charles Jones, Aiyana’s father, was present in the house during the police raid. His mother Mertilla testified he was forced to crawl out of the bedroom where he and Aiyana’s mother Dominika were sleeping with their three younger children, on his hands and knees, over broken glass. She said he picked up bits of Aiyana’s brains on the way to the couch where the child lay before SRT Officer Kata’Ante Taylor ran her out of the house. The morning of the raid, Jones sat outside the house crying in agony, sitting next to the blood-soaked couch where Aiyana, his only daughter died, as family members, friends and neighbors consoled him. 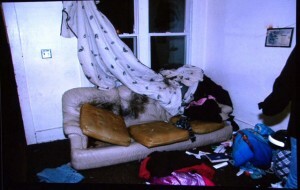 Evidence photo shows couch where Weekley shot Aiyana in the head. Hannah Montana blanket is at bottom of photo. Aiyana was lying under a Hannah Montana blanket when Weekley shot her, which was laid in front of her mother Dominika as an exhibit during her testimony in Weekley’s trial. Police leaked a story to the daily media only days after the raid that Jones had given a gun to Owens to kill Je’Rean Blake during a confrontation outside a party store May 14, 2010. The first question asked during a press conference held by family attorney Geoffrey Fieger May 18 related to that allegation. Jones, however, was not charged with first-degree murder in the case until October, 2011. Mertilla Jones earlier told VOD that police trained guns on Charles and Dominika’s three young sons when they arrested him where they were staying at the time. Chauncey Owens at Charles Jones’ preliminary exam. Owens at first pled guilty to second-degree murder in Blake’s death. His plea agreement said only that he would “tell the truth,” but the daily media kept reporting that he said Jones gave him the gun. This reporter combed through every page of his extensive court file but found no such statement. Later, Owens repeatedly refused to testify against Jones during his pre-trial exam. The Jones family has said they actually suspect another person in Blake’s killing. Owens’ attorneys earlier tried unsuccessfully to get his first statement to police thrown out, saying it was given under pressure after police allowed him to talk to LaKrystal Sanders on the phone, and he discovered that Aiyana was dead. Prosecutor Robert Moran then resorted to using Jay Schlenkerman, who several acquaintances told VOD was a career “jail-house snitch,” to testify against Jones. Schlenkerman has been convicted of numerous counts involving abuse and torture of women as well as drunk driving. He gave testimony at Jones’ pre-trial, as if from a memorized statement, that Owens told him Jones supplied the gun. Jail-house snitch Jay Schlenkerman testifies at Charles Jones’ preliminary exam. During the hearing, Judge Skutt granted Owens’ attorney’s request for a complete transcript of the Weekley trial. 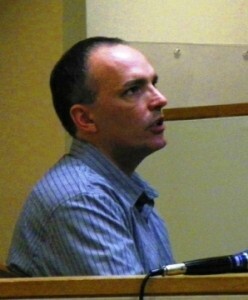 Attorney David Cripps noted that his client was referred to multiple times during the trial. Jones’ attorney Leon Weiss, of the Fieger law firm, said he believed the only real evidence the prosecutor has against Jones is Schlenkerman’s statement. He said the prosecution has since recruited a second “jail-house snitch” to testify against him, but did not indicate whether he will file another motion to exclude that testimony. In a case related to the filming of the raid on Aiyana’s home by A & E’s “The First 48,” A & E producer Allison Howard pleaded no contest to obstruction of justice charges, in exchange for the dropping of perjury charges against her. Assistant Prosecutor Moran earlier contended that Howard went to a party in the Detroit suburb of Canton with a police officer after Aiyana Jones was killed, and sold a copy of the A & E videotape to another man. However, police also locked up two other men in the Wayne County jail for several months, saying they showed a copy of the police videotape of the raid to a third party. A source told VOD earlier that police replaced that videotape, which was the one shown to the family’s attorney Geoffrey Fieger, with a second tape, wiping out crucial evidence. The prosecution never showed the Weekley jury a police videotape, only that taken by A&E, which does not show the inside of the house as Weekley shot Aiyana. 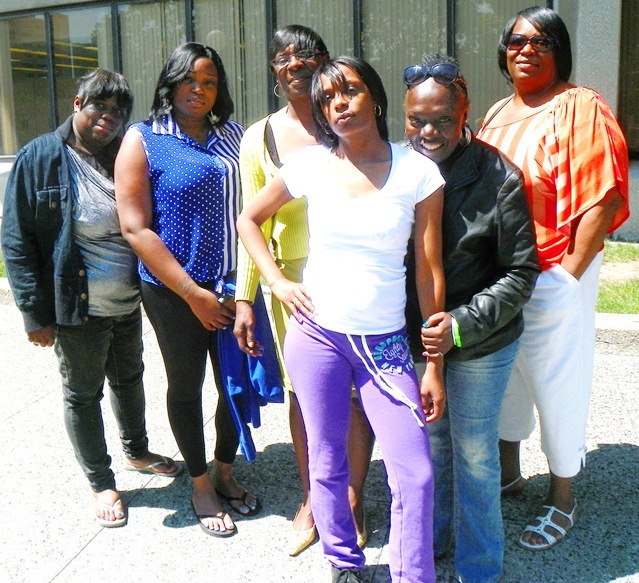 Dominika Stanley (front) with relatives and friends before mistrial was declared.